Many of our guests here at Sunnybrook Farm enjoy spending time with our animals - the entertaining Pygmy goats, our friendly cat Magpie, the hens and roosters, and the Muscovy Ducks. Our black & white cat, Magpie, loves children who are gentle with animals, and will often follow them around while they play. 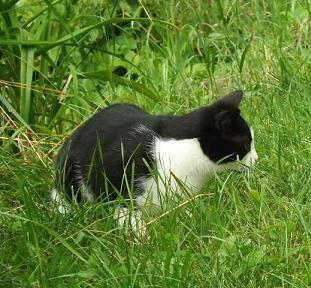 Magpie catches mice in the barn, and chipmunks too, but so far she hasn't been able to catch any wild birds! Magpie spends her summers living out-doors and winter-time in the barn with the other animals. Known as "Grandma Goat", Trixie was born in 2004 and is the daughter of Cinnamon and mother of Fairy and Pixie. She is a docile goat and gets along with everyone, although, she currently has a game of "I'm the boss of the feed rack" going on with the other goats and tries to keep them away from the food! Trixie is getting older now, she's slowing down and has arthritis in her knees, but she goes out to graze every day with the other goats. The twins, Pixie & Fairy were born in 2006 and are the daughters of Trixie. Pixie is black & white and Fairy is brown and white and they are playful and inquisitive. 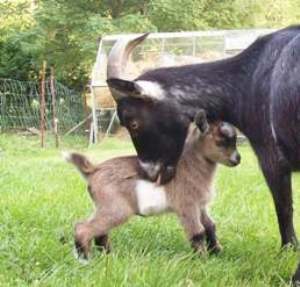 Both these goats have had babies in summer 2009, and you can see pictures of them below. This is Big Will, who is the father of Cappuccino. He has a sweet temperament and gets along with people and other goats. He is a fairly small, white goat with some black and gray. Bill Will has now been given to another family who have goats, and he no longer lives here. On September 1st 2009, little Cappuccino arrived - she is the daughter of Pixie and Big Will, and is adorable! She is a soft brown colour, is playful and curious and is carefully supervised by her mother, who spends most of the day washing her new baby. This is Fairy and her new-born twin boys - we named them Orville and Wilbur. They were born on 09-09-09 which makes it easy to remember! Orville is the slightly darker twin, and his brother Wilbur, is white like their father. 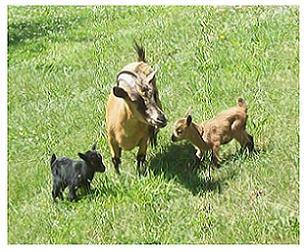 Here is Fairy with her babies from June 2010 - these are Demi and Daisy - male / female twins. We suspect these were born a little premature as they were really tiny, especially little Demi, the black male, who was very small. His sister, Daisy, was bigger and quite lively at birth, however, they are both feeding well, and are growing strong and adventurous. One of our hens who lay lovely tasty eggs for us all year long! The name of this one is Henrietta (or perhaps not) - they all look very much alike to me! Our hens live in the barn in winter, and free-range outside in the summer and live here until they die a natural death - we don't eat them - we run a Retirement Home for geriatric poultry! This is Dee-dee, our dominant Rooster - he keeps all his harem of hens in check - he struts majestically around the yard, doing his "chicken dance" and crowing at all times of the day. This is Sunny our other Rooster - he is not the dominant bird in the flock and as such does not get to mate with the hens - unless, Dee-dee is busy and Sunny can have a secret liason with one of the hens, away from Dee-dee's eagle eye! If he is caught, the reprimand is sudden and severe, but he seems to spend his time waiting for the opportunity to spend some private time with one of the hens. Here are a few of last year's chicks - Igor, Buddy, Dee-dee, Speckles, Sunny and Easter. Occasionally our hens hatch a clutch of their own eggs, but usually we purchase day-old chicks from the Farmers' Market in Aylmer. One of our Muscovy ducks, Stompers a female who was hatched here by her mother who hid her eggs in an old dog house! Duck eggs are delicious and great for baking - they make cakes and pancakes rise beautifully. Muscovy males are large - almost as big as a goose! Over the years we have had many of these ducks, but sadly, they are considered very tasty by Raccoons and Foxes. they are out on the lawn with their mother, Fairy. just getting their "legs" and learning to keep their balance. follow our daughter down to the barn for food. of them are playing and butting heads.